"The themes of innocence stolen, the refuge of the imagination, and the inclination to look away are handled with sensitivity and subtlety in some of the best prose of recent years encountered by this reader. Roy brings a painterly eye, her choice of detail bringing scenes to sensual life, while eschewing floridness: a masterclass rather in the art of restraint, the pared-back style enabling violence close to the surface to glint of its own accord." 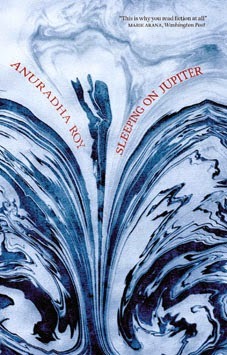 "Anuradha Roy’s brilliant new novel, Sleeping on Jupiter, is a riveting and poignant read...There’s a whole tapestry out there: lost innocence, displacement, violence, friendship, survival, unconventional love, rejection, and pain...all penned with excellent craft. The opening chapters are violent but etched in delicate, detached prose." "Both incredibly timely and extremely brave." "Playing hopscotch with narrative energy and moving with pointed fingers like one does in a whodunit, Sleeping on Jupiter is that nearly utopian beast – a literary page-turner....If you’ve ever lost something, you must read this novel. If you’ve ever found something you lost, you must read this novel too."